Torch of The Faith: News / Comments / Unlike His Predecessor... A Fun Word Game for Families Everywhere! Unlike His Predecessor... A Fun Word Game for Families Everywhere! Keeping a weather eye on the global situation, we hear that Vatican officials are out searching with their ''intelligence resources'' for the good Archbishop Carlo Maria Vigano, with a view to prosecuting him for alleged crimes against Vatican and Church law. At the same time, Francis has doubled down on his own mysterious silence in the face of Archbishop Vigano's allegations, by using yet another homily as a kind of Vigano-proof weathershield. Having already tried to paint himself as the silent hero earlier in the week, he then suggested on Thursday that it was ''a bad sign'' when a Christian accuses others, when they ''badmouth'' others. Perhaps we should be glad that he indirectly admitted that Vigano was a Christian! In the meantime, the propaganda machine has maintained its steady pace with the release of the expert mathematician (''2+2=5!'') 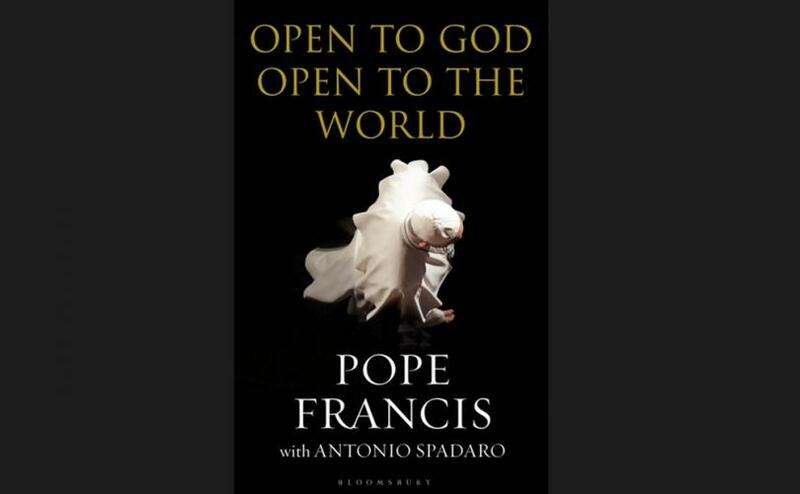 Antonio Spadaro's new book, Pope Francis - Open to God: Open to the World. I see that Lianne Laurence of LifeSiteNews has already drawn attention to the electronic publicity blurb for this new book; which uses the launch as an opportunity to criticise Pope Benedict XVI. There are a number of things one might say in response to this kind of cheap shot fired across the bows of Benedict and faithful Catholics everywhere. In the first instance, it is amazing to see such a book being released at the height of such a scandalous and ongoing crisis involving Francis and his key personnel. This certainly demonstrates that Francis and his friends seem not to have realised that - like some kind of real-world Yosemite Sams or Wile E. Coyotes who just won't look at reality - they have already run themselves right over the edge of the cliff face. Then again, an academic might suggest that Francis did not write learned books because he was not, well, to be brutally honest, that learned... But charity would probably forbid such a retort from being made. Plus, there is the inconvenient fact that a great deal of Benedict XVI's output was an expression of his own dialogue with the world. I'm thinking, to name but a few, of books like: Christianity and the Crisis of Cultures; Europe Today and Tomorrow; and Without Roots - The West, Relativism, Christianity, Islam. Then again, one could only splutter into one's coffee at the suggestion that Francis is so busy in dialogue with the Universal Church. Perhaps if the new book's blurb had stopped with its claim about Francis' ''dialogue'' with the outside world, then that might have been fair enough. After all, he is good friends with the likes of the secular mass-abortionist Emma Bonino. But dialogue with the Universal Church? How anyone could make such a claim when Francis has ignored the requests of the 790,000 faithful Catholics who asked him to uphold the Church's teaching at the ''marriage synods'', the requests of the 4 Cardinals to have their vital Dubia answered, the request of the 16,000 to disinvite his homosexualist buddy James Martin from the World Meeting of Families in Dublin, or the whole world full of Catholics now wanting answers about Archbishop Vigano's claims, is simply beyond telling. But then, poor Antonio isn't terribly good at mathematics, is he? Anyway, whilst those kind of retorts could be made, I thought it would be a bit more fun to consider some rather more accurate lines for a future updated advertising blurb for Spadaro to draw on, next time around. Unlike his predecessor, Francis never kneels before the Blessed Sacrament. Unlike his predecessor, Francis engineered two synods in Rome to subvert the traditional teachings on Holy Matrimony, Confession and Holy Communion. Unlike his predecessor, Francis' efforts in this regard caused untold amounts of confusion, heartache, anger and loss of faith all around the world. Unlike his predecessor, Francis' efforts led to countless sacrilegious Holy Communions being made all across the world. Very troubling indeed, that one. Unlike his predecessor, Francis encouraged even Protestants to receive Holy Communion in a similarly sacrilegious manner. It's a wonder the world hasn't been fried yet, isn't it really? Or, unlike his predecessor, Francis protected, and if claims are proven true, even enabled, a cabal of predatory homosexuals to hide themselves in the episcopate and priesthood, piling up victim lists of the innocent. May God heal the souls of those poor children and young seminarians who were so filthily harmed and scandalised. Don't forget the warnings of Akita, Fatima, La Salette or Quito. Unlike his predecessor, Francis refused to answer simple and honest questions when reporters tried to get to the truth about allegations made against him by a credible, conscientious, prayerful and widely respected archbishop. Unlike his predecessor, Francis is free to come and go as he pleases; speaking to all people everywhere and anywhere, without the omnipresence of someone like Georg Ganswein constantly hanging about. 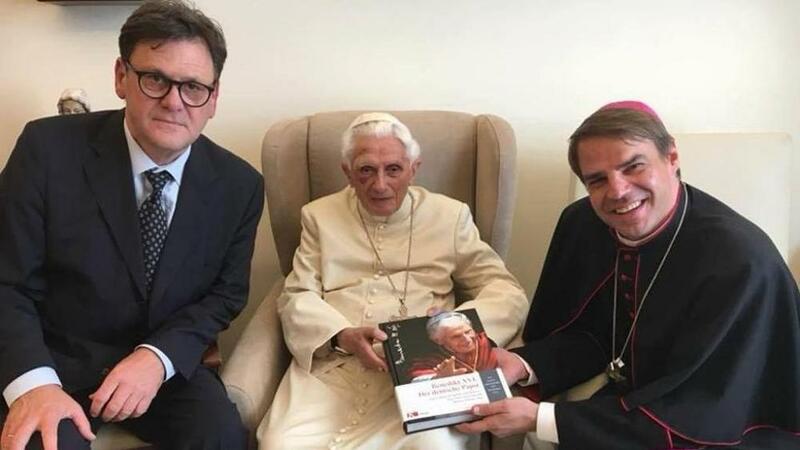 The German Bishop Oster with Pope Benedict - He's the one with the bruised eye. Hey, after 5 years of all this, maybe you could come up with a few ''Unlike his predecessor'' lines of your own. It could even be a fun word game for all the family. Go ahead: Knock yourselves out! Stay Calm - Keep the Faith!